Despite the bright lights that the King Song KS-18L/XL is equipped with, it is worth to think about additional reflectors. In this article you will learn how to easily add aesthetic reflective lights to your unicycle. Unfortunately, the manufacturer did not considered any reflectors that could improve the visibility of an unlit unicycle. Fortunately, this is not a problem that you could not solve in easy way. In addition to the pleasure of improving your wheel by yourself, you get better visibility, which is particularly important when you sometimes have to drive along the side of the road on which the cars are moving. Self-adhesive reflective foil is relatively cheap and easily accessible, so you only have to cut out the appropriate shape of the elements and stick them on the monocycle. For your convenience I have prepared a special template, which will allow you to quickly and aesthetically equip your KS-18L or KS-18XL unicycle with clearly visible reflectors. Reflective foil can be purchased on the Internet, but you can also visit a plant producing road signs or advertisements. Personal charm combined with a demonstration of riding on one wheel give you a chance to receive fragments of foil from waste. Free of charge. Minor remark – the photos included in the article document cutting strips for two unicycles at the same time. For my own needs I prepared a template with two sets of strips to stick to both my wheels – KS-18L and KS-18XL. 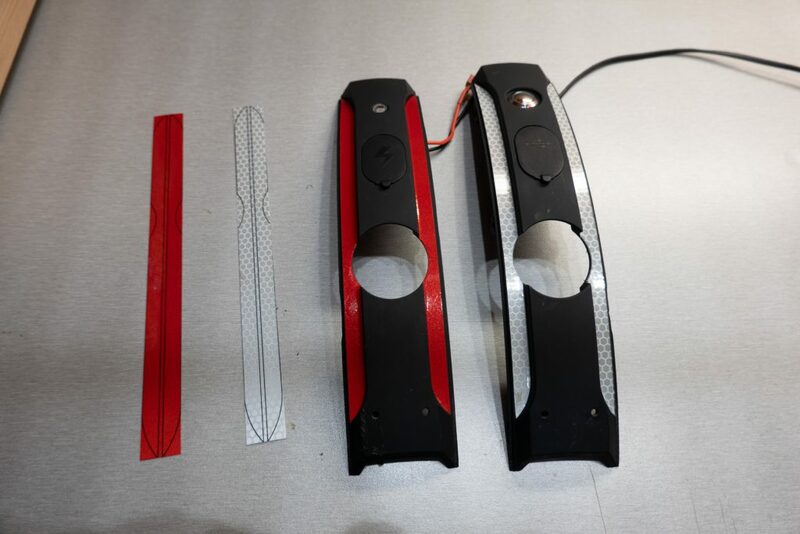 The template attached to the article contains two sets of two strips each – one set for the front (white) and one set for the back (red) of the unicycle. First print the template on the self-adhesive transparent film. The pattern in the PDF file is already sized accordingly, but remember to turn off the adjustment of the printout to the paper size in the printing options. The point is to print it in 1:1 scale. After printing the template, you should cut out fragments with a pair of stripes for each of the reflective foil colours. 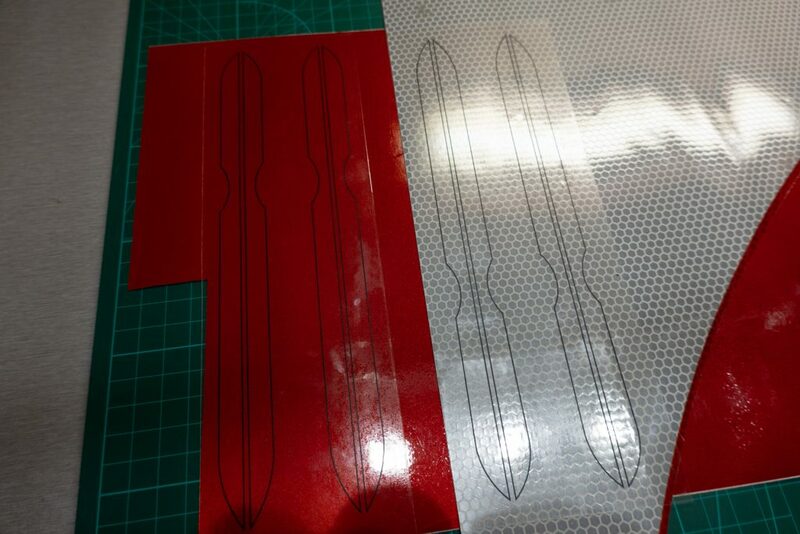 Once you have cut out the sets of strips, stick them on each piece of reflective foil. Then, using a knife and a metal ruler, cut the stripes along straight lines. 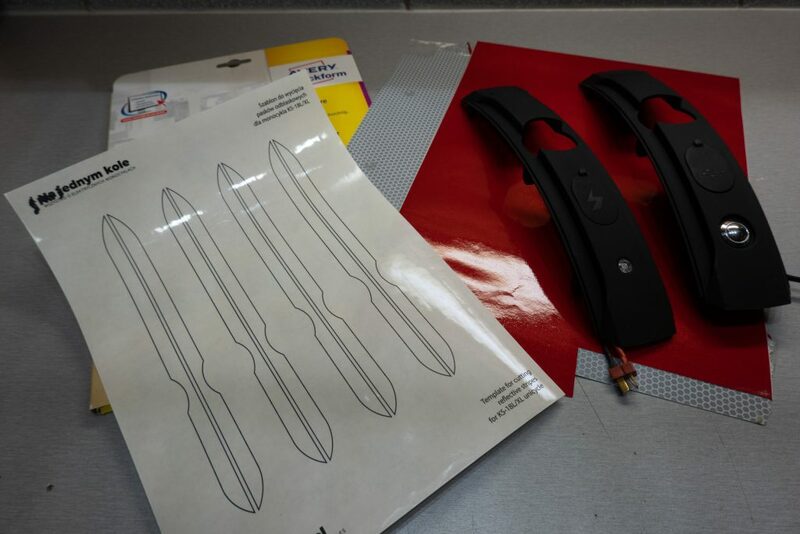 Arches and curves are cut with scissors. 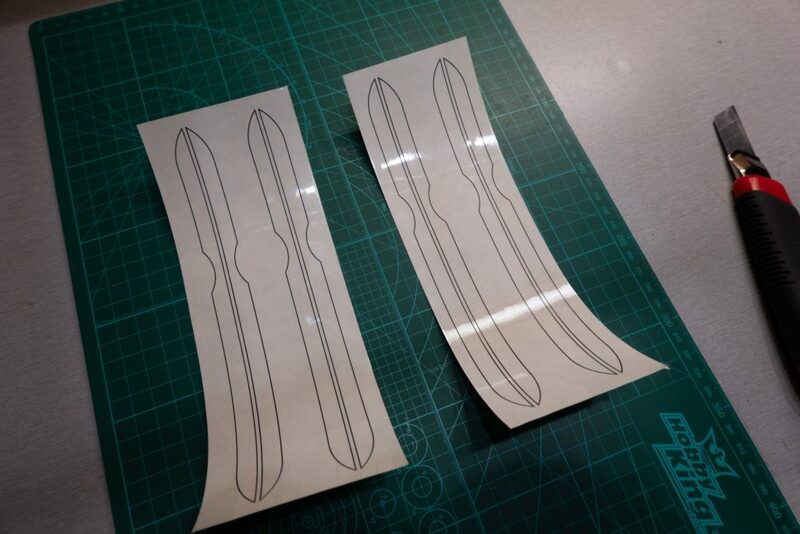 If you do not want to peel off the transparent foil later, cut the inner edge of the outline so that no black edges remain on the reflectors. Depending on the type of reflective film, peeling off the transparent film may be more or less onerous. Once the strips have been cut out, it remains to stick them on the unicycle. I sticked the reflectors on the occasion of the major inspection of one of my wheels and I had the wheel dismantled. Of course, you do not need to dismantle your wheel to stick the strips. But remember about thorough cleaning and degreasing the areas into which the strips are to be sticked. The rubber finish of the cover material is not particularly adhesive, and contaminants (even invisible) make the matter even worse. Isopropyl alcohol (isopropanol) is best used to degrease the surface. A convenient way is to use disinfection swabs that are already pre-soaked in alcohol at the factory and can be bought at any pharmacy. You can also try ordinary spirit (but not denatured). Never use petrol, acetone or metal degreasers. After sticking the strips it is worth to press them on the whole surface with a soft cloth, taking care not to tear off the corners with the cloth. In this simple way, your KS-18L or KS-18XL got reflective lights, which will complement existing lamps, thus increasing visibility on the road. The advantage of the reflectors is that they are visible from a much larger angle, and when illuminated by the car, they clearly mark our presence when driving on the side of the road. 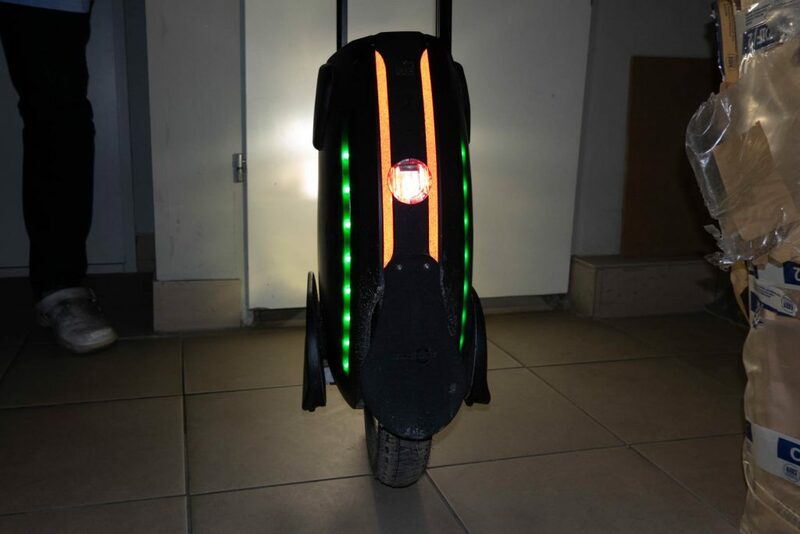 Electric unicycle is a modern and convenient way of personal transport. For short, but also for longer distances. On these pages you will learn everything about electric unicycles.